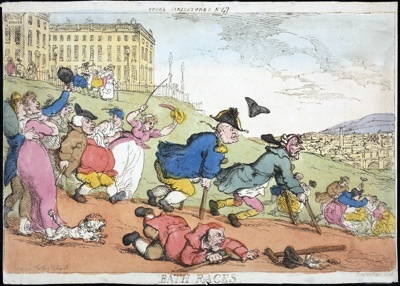 In 1798, the famous caricaturist Thomas Rowlandson drew The Comforts of Bath, a series of satiric drawings. 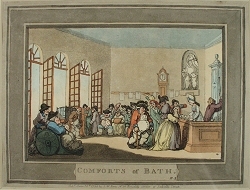 The cartoons were used to illustrate the 1858 edition of the New Bath Guide, written by Christopher Anstey and first published in 1766. 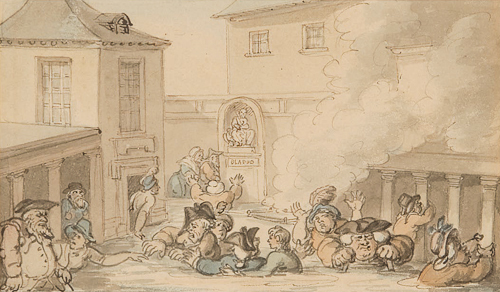 * Rowlandson depicted both the social and medical scene in Bath just before the period described by Jane Austen in Northanger Abbey and Persuasion, and by Georgette Heyer in her Regency romances. 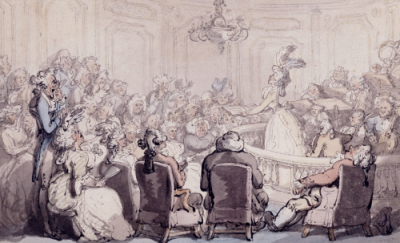 In this post I combined Rowlandson’s images with excerpts from an 1811 guidebook, A new guide through Bath and its environs By Richard Warner. 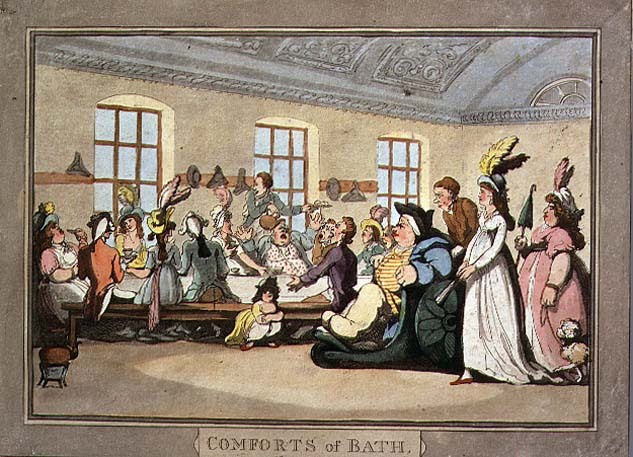 The scenes depict the use of mineral water therapy for the invalids who flocked to Bath, a city whose fashionable post-Nash reputation was already well past its prime and whose medical men were generally regarded as quacks or, worse, “potential murderers”. 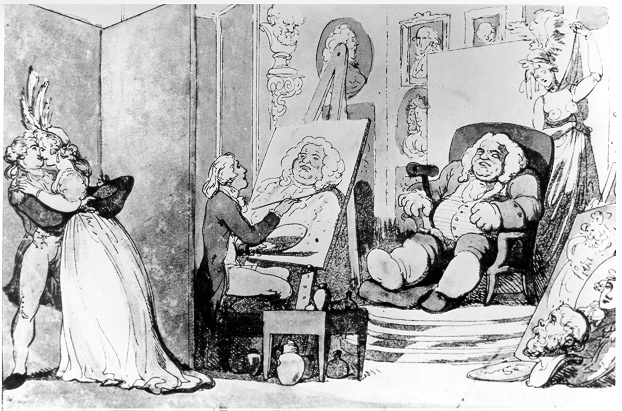 The rotund gentleman in front and center of all these scenes (who undoubtedly suffered from gout, a painful rich man’s disease), was conjectured to be based after Tobias Smollet’s Mr. Bramble. In the pictorial’s subtext, notice how “Mr. Bramble’s” young wife (companion or daughter) flirts with the young officer who boldly woos her (Image above). 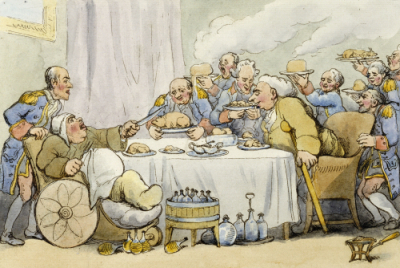 Even while satirizing them, Rowlandson gets the social details just right. Underneath each image sits a quote from the guidebook. I’ve always been horrified by the thought of all those sickly people sharing the same warm water. I imagine bits of scabby flesh everywhere – and who knows what other bodily fluids. Do you know if the waters they drank and the waters they bathed in were kept separate at all, or if they came from different springs? Neither link addresses your concern, but I suspect that fresh waters keep bubbling up. I love Bath, it’s one of my favorite places in England. I wonder Tamara, since at least the women wore clothing while they bathed if there were less bits of scabby flesh from them. 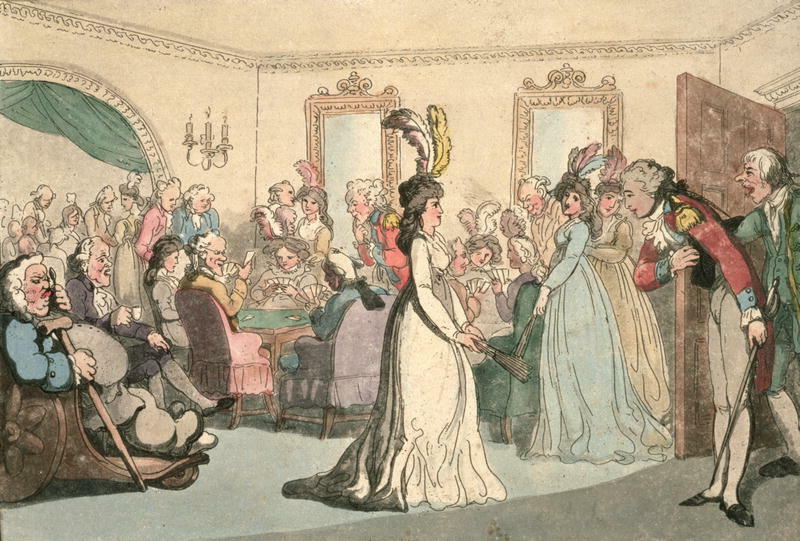 I’ve always adored the Rowlandson prints; they made for delicious research material when I wrote BY A LADY, which was predominantly set in Bath in 1801. It’s one of my favorite places in the world and I was lucky enough to participate in the Jane Austen Festival there in 2006 doing a costumed reading and signing from BY A LADY. 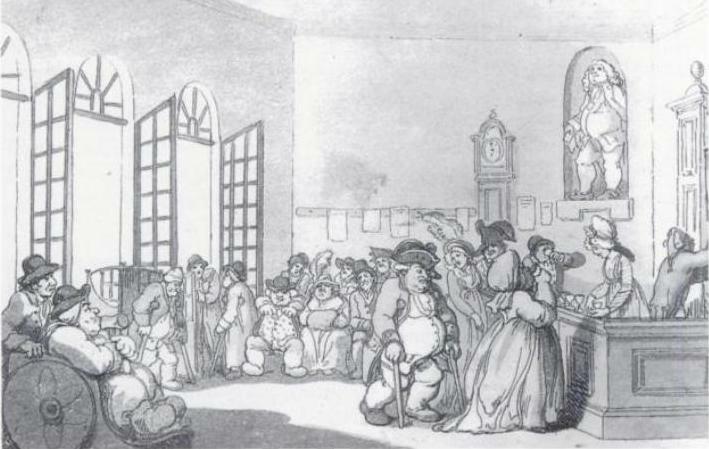 I also researched the history of the baths themselves and what the Georgians wore to bathe in them. According to my research the men and women wore brown shifts and the baths were not segregated by gender. Consequently, people gave eyewitness accounts of people copulating right there in the open-air baths. It’s also amazing how they thought a few pomanders would remove the communal stench (of filth, not minerals) from the waters! I have a drink of the sulphurous stuff whenever I visit the Pump Room, even though I don’t like the taste. When in Bath …!